Flower Power is a 3-line classic slot released by Microgaming. It comes with a wild symbol and a top fixed jackpot of 5,000 coins. 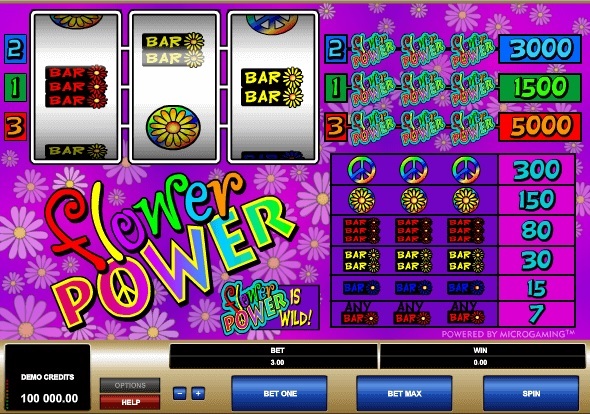 Flower Power is a simple classic slot, owing to which it is incredibly easy to play. To start, players should first activate anywhere between one and three paylines. The slot allows a top coin bet of one coin per payline. Players can choose from a coin value range of $0.25 and $5.00. The betting range is $0.25 to $15.00, which makes it an ideal slot for low-stakes players. After placing their bets, players should click on the Spin button to set the reels spinning. Players will get paid according to the game’s pay table if a winning combination is displayed on the screen at the end of a spin. If there is no winning combination of symbols, players can place another bet and try again. Flower Power slot can be played in two modes—the regular mode and the expert mode. While the regular mode has no advanced features, the expert mode comes with features such as Autoplay, which allows players to play the game automatically. Flower Power is a simple slot based on the flower theme. It reminds players of the slot machines of old, which lacked bonus features. The reels are populated with peace signs, flowers, and bar symbols. The Flower Power symbol serves as the wild, substituting for all other symbols across the reels and helping players complete winning combinations. The Flower Power wild symbol is also the jackpot winning combination. If players land three of them along the first payline, they will win 1,500 coins. If they land the same combination along the second payline, they will win 3,000 coins. If players want to win the top fixed jackpot of 5,000 coins, they must land this combination along the third payline. Flower Power slot has a generous payout structure. If players land combinations of three Peace Sign symbols and three Flower symbols along any active payline, they will win payouts of 300 coins and 150 coins, respectively. The bar symbols reward players with lower payouts. If players land three 3-Bar symbols along an active line, they will win 80 coins. The lowest payout of 7 coins can be won by landing a combination of any 3 Bar symbols along an active payline. Since Flower Power is a simple slot, it lacks bonus features such as free spins, scatter wins, gamble feature, expanded wilds, bonus games that open on second screens, progressive jackpots, and so on. But it is the ideal slot for those seeking the pure slot gaming experience without the distraction of bonus features. Flower Power is a simple, fun, and relaxing slot for beginners, uncluttered with complex bonus features, but offering a 5,000-coin jackpot.